Tuesday: Hot and very humid, scattered afternoon and evening storms. Highs in the 90s. Overnight Tuesday Night: Any thunder dwindles, muggy. Lows in the 70s. Independence Day: Sun & clouds, isolated afternoon thunder. Highs in the 90s for most. Tuesday should make five days in a row of 90 degrees or warmer in many parts of New England as a multi-day heat wave continues much of this week. Most of the records for heat have been set in Western New England, where temperatures have been 95 to 100 degrees, breaking previous marks from 1964, 1963, and 1901. Patchy fog and low clouds should burn off quickly as temperatures jump to near 90 before lunchtime. Hot to record hot is likely again Tuesday afternoon, with many spots reaching 90, but there's also a threat for a shower or thunderstorm just about anywhere during the afternoon and evening. The storms could be intense, but they're going to be highly localized and slow moving. Any showers or thunderstorms evaporate Tuesday evening, for another nice night of fireworks viewing. There will be a similar set up for Independence Day. 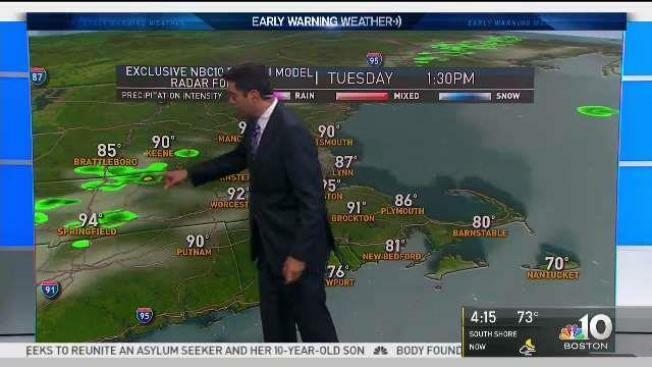 Sun, clouds and high temperatures in the 90s are in store, with a better chance for a shower or thunderstorm in southern and western New England. But most of our parades and evening fireworks will probably go off without a problem, even though it continues to be hot, with a high temperature well into the 90s again. Thursday is more of the same, with sun and clouds and a chance of a storm and highs in the 90s. The heat wave likely breaks Friday with a line of more organized and powerful thunderstorms moving from northwest to southeast. High temperatures will be close to 90 degrees. The weekend looks nice, though, with sunshine and much less humid air and a high temperature in the lower 80s.